Effectively throwing in the towel on an earnings estimate for the year before the end of the second quarter appears both defeatist and unfocused. Especially true when you have an activist investor and a recent agreement on targets. The announcement seems premature and suggests that the current GE management team is either not capable or not willing to make the hard decisions needed to drive both top and bottom line. It is commonplace for investment banks and other companies in very cyclical businesses to institute severe austerity measures when it looks like the year is not going as well as expected – cutting unnecessary costs and moving to zero-based short-term budgeting. (Most of us have experienced this once or twice in our careers if we have worked for Investment Banks). In the Industrials and Materials space, we have seen the same focus and great results in Air Products, when Seifi Ghasemi took charge – with the company boosting earnings immediately by halting all unnecessary spending. Maybe it is not that GE’s management is unwilling to do what it takes; maybe the company is so complex that they cannot see the wood for the trees. Note that prior to the spin of Chemours, DuPont announced a significant cost reduction program – mostly driven by an exercise to allocate central costs before the spin, which resulted in both companies realizing that they did not need the cost being discussed. Trian originally pushed for a break-up of DuPont because the activist felt that this might be the only way to identify and eliminate costs effectively. Mr. Immelt is suggesting that the goals he only recently agreed on with Trian are now a stretch target, and in a general global market, that while not great, has produced much better first quarter results for many industrials. It may be time for someone else to take the reins at GE and it may be time to start seriously considering a breakup of the company into more manageable pieces. This should quickly identify buckets of costs that would become redundant. It would also focus each potential independent business on a go-it-alone strategy which would also likely unlock some cost opportunities. 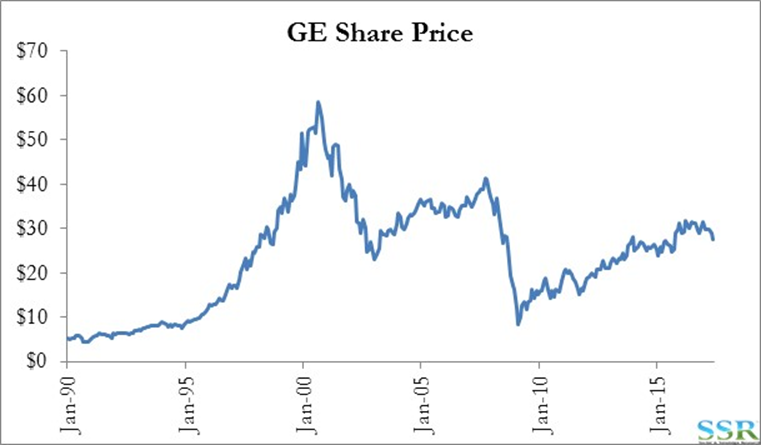 We do not believe that there is some “magic wand” solution that can take GE back to its highs of the last decade, but we do believe that focus will drive lower costs and possibly more appropriate growth/innovation strategies for the individual businesses, as well as other possible M&A – like the Baker Hughes deal. We continue to believe that we are at a point of inflection for GE, that Trian will likely be the catalyst, and that the stock can see $40 per share within 18 months – more than 40% upside from here. See prior research.